Major policies of World Party Côte d'Ivoire are as follows. Basic benefits of the World Federation are as follows. Therefore, establishing the World Federation is a political policy but, at the same time, it is the most effective economic policy. Especially, these benefits are very important for developing countries. The policy of World Party is based on the paper "International Party for the World Government". This thought is modified in "World Parliament Statute" and "Constitution of World Federation". In "International Party for the World Government", the World Parliament is under two-chamber system. But in "World Parliament Statute" and "Constitution of World", the World Parliament is under single-chamber system. For more detail, please read each document. Following policy is a modified one from "International Party for the World Government". Basic policy is to directly elect the delegates of each country in proportion to population and send them to the World Parliament. The World Parliament is under single-chamber system, and the house has basically 1,000 members. 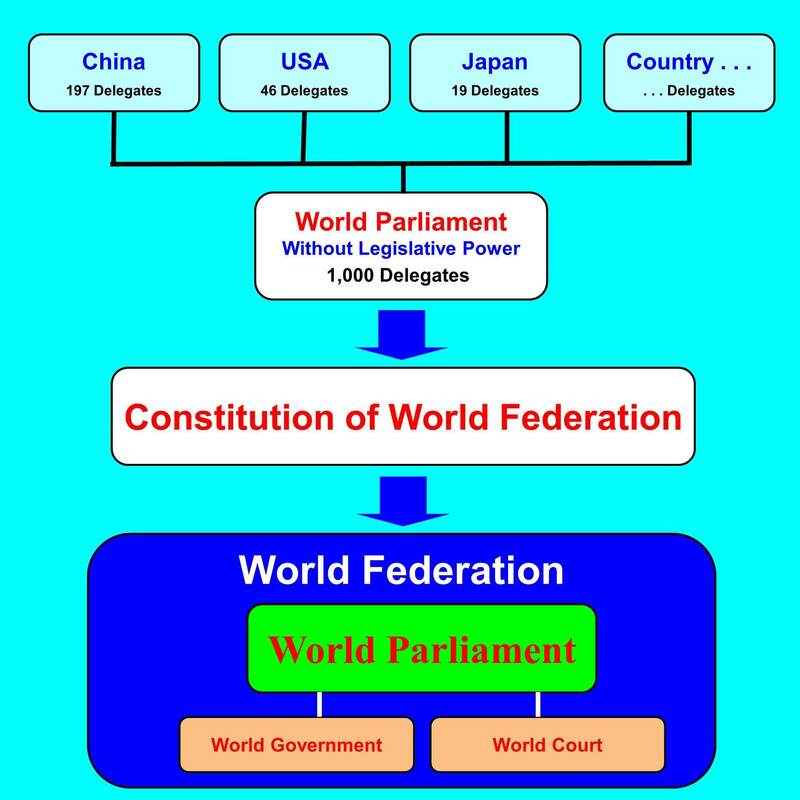 Process to Establish the the World Federation Is Shown in the Figure below. For more detail, please see the page of the World Party. As we can know from the bombing on Afghanistan and Iraq, USA, the most powerful country in the world, does not respect the United Nations. We can say that the respect for United Nations is the first step to the world democracy. Mahatma Gandhi led India to independence by the policy of Non-Violence & Disobedience. This policy is applicable to the present situation of world politics. Nuclear states are dominant because of their military power. But non-nuclear states need not rely on the military power. Non-nuclear states can unite and put sanctions against nuclear-states. For example, non-nuclear states can put high tariff rate barrier against nuclear states. Or, they can boycott the products from the nuclear-states. Like this, non-nuclear states can, by uniting together, insist on their opinion against nuclear-states. So this policy was named, with the respect for Mahatma Gandhi, "Mahatma Gandhi Initiative". Of course, Mahatma Gandhi Initiative is applicable not only for the nuclear states but also for other militarily or economically powerful states. For example, if some come countries attack other countries without resolution of United Nations, products from those countries should be boycotted or trade should be restricted by tariff barrier by the Mahatma Gandhi Initiative. Anyone who supports the policy of World Party can join the party. Anyone who wants to found a branch of World Party can apply for it. Information such as news, schedule of movement etc. are shown in World Party Forum and other pages. is the logo of the World Party. This has been registered with Japan Patent Office. Dark blue of background means the universe. Blue circle means the earth. Green circle means the life on the earth.